The origins of tortilla soup may be a mystery, but its intriguing roasted flavors has long made it a favorite soup in my seasonal menu rotation. Throughout my travels in Central America, I discovered that tortilla soup it’s self is not as ubiquitous throughout Mexico. The soup appears to have originated from the home kitchens found in the very the center, around Mexico City. As with any dish, there are a million and one ways to prepare it. Stock, meat, vegetables and spices vary according to region and period. The common thread for all recipes is the inclusion of crisp tortillas, Tortillas provide the grain component, commonly found in soups throughout the world. European soup grain equivalents are pasta, rice, barley, and dumplings. Food historians generally tell us soup is ancient. It is consumed by all segments of society. Recipes have been shared, imported, adopted and adapted whenever peoples of divergent cuisines meet. This explains why many of the ingredients listed in traditional Mexican Tortilla Soup are from the Old World. Tortillas are generally the most common food found throughout Central America.Except for the tomatoes, the other ingredients chicken, beef, onions, oil, spinach, salt, pepper and cheese are “Old World” foods introduced to Mexico by Spanish settlers. The use of tortillas, in this soup recipe, more likely descends from European practice of adding crisped bread to soup (think croutons & crackers) rather than ancient Mayan/Aztec food customs. The best guess any one can estimate the arrival of tortilla soup in the Unties States in or around southern California, probably points to Encarnacion Pinedo’s 1898 California cookbook “El Cocinero Espanol“. A version of the dish also appears in “Elena’s Famous Mexican and Spanish Recipes,” first published by Elena Zelayeta (1893-1974) in San Francisco in 1944. Most Americans became familiar with the dish after dining at Zona Rosa, a popular nightlife and restaurant district in Mexico City. Fonda El Refugio started serving authentic interior and coastal Mexican cooking to tourists in the 1960s. than anyone on the staff can remember. And the soup started to appear in haute versions in other restaurants in the 1980s, when regional Southwestern flavors were championed by chefs such as John Sedlar. 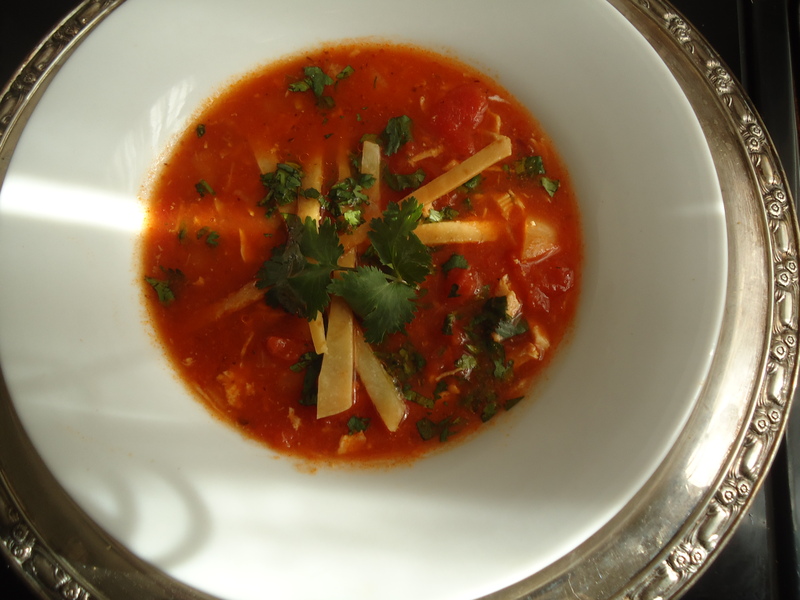 As the recipes evolved with time, Tortilla Soup, has come to be composed of a tomato and chicken-broth based recipe topped with tortillas, is more closely aligned with authentic Mexican cuisine. Although some will argue that authentic tortilla soup possesses certain characteristics, there’s no wrong way to make it. At its most fundamental, tortilla soup. Cooks may add what they wish-from bits of chicken and avocado to elegant squash blossoms and vegetables, especially tomatoes. Some purists insist that epazote, a Mexican herb, also is an essential ingredient. 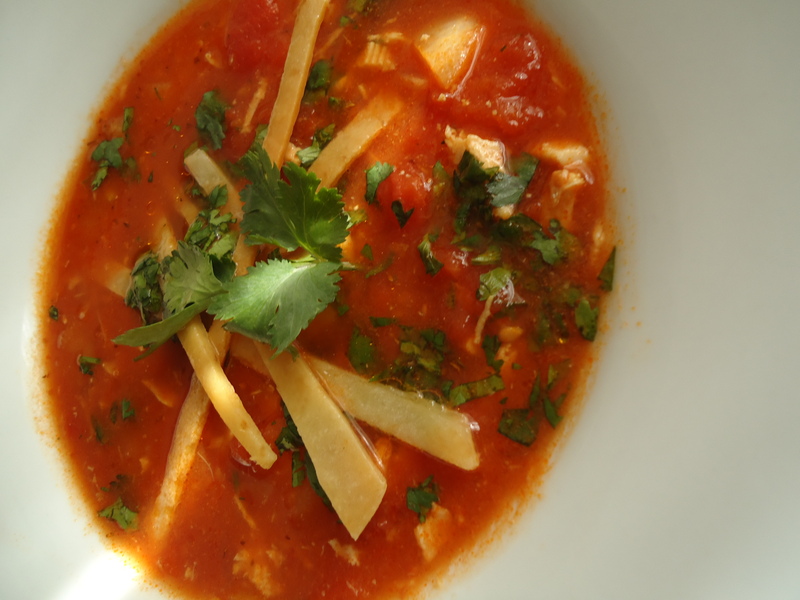 Mrs. Zelayeta, was the doyenne of Mexican cooking in California, and in reviewing her recipe, below, you will see it is a simple combination of broth, tomato puree and tortilla strips, to which she added mint leaves. Jaime Martin del Campo and Ramiro Arvizu of La Casita Mexicana in Bell, near Los Angeles riff on a classic central Mexican version by pureeing guajillo chiles along with tomatoes. They grind fried tortillas with the mixture too, which amplifies the corn flavor. The version once served by Carlos Haro of Casablanca Restaurant in Venice, California was adapted from a recipe by cookbook author Alicia Gironella De’Angeli of Mexico City, used roasted vegetables and chicken stock, lightly thickened with beans, is the base, then chopped cilantro, fried tortilla strips and raw onion are added to the broth, along with a garnish of cool queso fresco and crunchy roasted chiles. I have also found that other great versions of the simple soup was composed of spicy chiles, ground tortillas and roasted vegetables topped with crisp tortilla strips and cool strands of sour cream. In my version of the soup, I added some roasted chicken to give it a little more body to it. If you do not have the time to roast a chicken, picking up a rotisserie chicken from the supermarket works great in a pinch. Line a baking sheet with foil. Lay tomatoes, garlic and onion on the foil Put baking sheet in oven and allow peppers to roast for 20 minutes. Remove baking sheet. Using tongs, tomatoes and onions a half turn, then place back in the oven for another 20 minutes. Turn off the oven and then add the chiles and them for a few seconds. Allow the vegetables to cool. Chop the onion and garlic. Heat the olive oil in a medium saucepan. Add the garlic cloves and saute over medium-low heat for 1 to 2 minutes. Add the tomatoes, breaking them up with a wooden spoon. Add the onion, chiles, white pepper, cumin, paprika, oregano and cooked chicken. Cook for 10 minutes. Add the tomato juice and chicken stock. Bring the mixture to a boil, then reduce the heat and simmer 15 minutes. Taste and adjust the seasoning with salt and pepper as needed. For the tortilla strips: In a medium, heavy skillet, pour enough oil to reach a depth of 1/2 inch. Heat over medium-high heat until very hot but not smoking. Add the tortilla strips in batches and fry until golden and crisp, about 2 minutes. Remove with a slotted spoon and drain on paper towels. Set aside. To serve, ladle the soup into 4 individual serving bowls. Serve with sour cream, avocados, cheese, tortilla strips, cilantro and lime wedges on the side. Look for ground dried ancho chiles ,sometimes labeled pasillo, in the spice section of selected markets, especially in Latino markets.